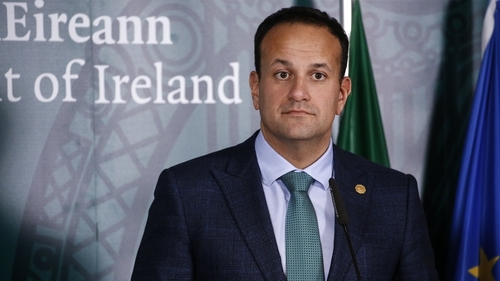 Taoiseach Leo Varadkar has described Brexit as "the political equivalent of climate change" and warned of a return to violence in Ireland if a hard border re-emerges. Speaking at an EU summit in Brussels today, Mr Varadkar said that Brexit will "permanently change the relationship" between Ireland and the UK and the UK and Europe. The Taoiseach told EU leaders that no-one in Ireland or in the Irish Government was in any way "exaggerating the real risk" of violence. His remarks follow his decision to bring the leaders' attention to an Irish Times article about the murder of five people at a border customs post in 1972. He told reporters: "I thought it was a useful prop to demonstrate to all of the European leaders the extent to which the re-emergence of a hard border and a return to violence are very real. "This was the front page of an Irish newspaper published yesterday, interviewing family members, the daughter of somebody who was killed at a customs post on the border between Ireland and Northern Ireland back in the 1970s. "That is what used to happen when we had customs posts in Ireland. I wanted to make sure there was no sense in the room that, in any way, anybody in Ireland was in any way exaggerating the real risk of a return to violence in Ireland." The Taoiseach said EU and UK negotiators are "working away behind the scenes". They had made some progress, but not decisive progress. There were still big gaps both in terms of shape of future trade relationship, but also on the backstop, he said. He said the EU27 leaders had agreed to maintain their support for Michel Barnier and the Article 50 Task Force and to maintain unity. There was not enough progress, he said, but leaders had called on the Task Force to intensify work in the weeks ahead. A senior EU source has said December is the most likely target for agreement, given that much more time was needed to reach agreement on the backstop. The Taoiseach said EU leaders understood that British Prime Minister Theresa May did have to get an agreement through parliament, and were aware of the "enormous challenges" she had to get through. He said any deal also had to be ratified by the European Parliament. "Prime Minister May didn't attempt to row back from those commitments," he said. He said both sides never want to have to invoke the backstop. "We both agreed it should be temporary, that it should only apply unless and until - it can't have an expiry date." Mr Varadkar said the EU had reservations about the idea of a UK-wide customs backstop, which was done through the Withdrawal Agreement. "We couldn't have a situation whereby the UK had access to the single market and at the same time was able to undercut us in standards, whether it was environmental standards, health, state aid, and competition standards." He said Brexit was not a passing squall: "It's the political equivalent of climate change, it's a permanent change, not in the weather, but the climate when it comes to relations between Ireland and the UK, and the UK and the EU."